The story takes place in 1920’s Berlin. After having a fling with a British writer, American chanteuse Sally Bowles tries to create a career as a gold-digger, making overtures to a handsome aristocrat, while the Nazi rise to power puts dampers on their swinging lifestyle. Based on English author Christopher Isherwood’s autobiography Berlin Stories, the book opens with the lines “I am a camera with its shutter open.” These lines signify a snapshot of a lost world, the cosmopolitan Berlin of the 20’s and 30’s, where cheerful expats dance and revel, whirling faster and faster in the hope that it will save them from the rise of the Nazis. 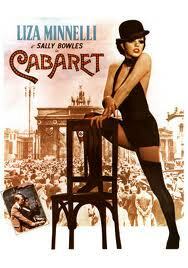 In the film, Isherwood’s character, the audacious and tragic Sally Bowles (Liza Minnelli), takes centre stage. Liza Minnelli, whose later work included Arthur, is great in this role and looks fabulous in her 20’s fashions. Director Bob Fosse’s (Chicago, Lenny) choreography and camera work is dazzling. This film holds up as a great musical that’s exceedingly enjoyable even as it’s also sometimes chilling. Released in 1972, the film won eight Academy Awards.